Competitors enjoyed fine, sunny conditions with a 15 knot easterly for the final 2 races of the regatta. With the exception of a wind shadow from a departing cruise liner briefly affecting the course for the Masters the breeze stayed true throughout both races with good waves for downwind sailing. Andy Maloney continued to dominate the open fleet to earn himself the title of NZ National Laser Champion 2013. Sam Meech was a clear 2nd followed by Thomas Saunders with Italian sailor Francesco Marrai taking the under 21 title from Jeremy O’Connell. In the Radial fleet Andrew McKenzie continued his success to take both the Open and Youth Radial National titles. Matt Kempkers was runner up for both taking 2nd place overall from new Women’s Champion Rachel Basevi on countback. Second in the women’s division was Sara Winther who despite good results today was unable to overcome her slow start. The Radial Youth women’s title was won by Ali Nightingale. New Masters competitor Kris Decke continued to perform strongly to take the overall Masters Title and the Apprentice Masters Division. Second overall and winner of the Masters Division was Andrew Dellabarca with the Grand Masters Division being won by Nick Page who was 8th overall. In the Radial Masters, Scott Leith again proved his class with another 2 strong performances to win the overall title and the Apprentice division. Hamish Atkinson from Christchurch took out the Masters Division. Current World Radial Grand Master Champion, Mike Keeton took the Grand Masters Division despite still recovering from recent surgery while the Great Grand Master Division was won by Bob Blakey after a close contest with Garth Cheyne. The 4.7s were won by Bryn Bennett from Worser Bay. Today’s favourable conditions allowed all racing to be completed before 3pm, in stark contrast to Friday’s 7pm finish after 9 hours on the water for the sailors. The successful completion of the contest, with all scheduled races completed despite difficult conditions was a credit to the Napier Sailing Club Race Management Team. Next years Laser Nationals will be in Nelson which should again provide an excellent and testing venue. NZ Laser Nationals Day 3 – Champagne Sailing at last! Clear sunny conditions, a gentle sea breeze which never got over 12 knots and some waves to work with greeted the fleet today. Yesterday’s 180 degree shifts, calms and gales were forgotten and it was ideal sailing conditions for all, allowing the race officer to lay the course and run races continuously to get the regatta fully back on schedule. Andy Maloney dominated the open fleet with three bullets from 3 races to lead overall from Sam Meech who had to be satisfied with three seconds today, leaving everything to play for in tomorrows final two races. Thomas Saunders continued to be the best of the chasers to hold third overall followed by two of our international visitors, Francesco Marri from Italy in fourth and Dutchman Nicholas Heiner in 5th. 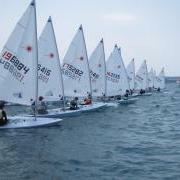 The Radial fleet had 4 races today to catch up with the schedule as they did not complete any races on the first day. The day was dominated by last years youth rep, Andrew McKenzie, with three firsts and a third to lead convincingly overall. He is followed Second overall is overnight leader Rachel Basevi, who won one race today and had consistent results in the other 3 races. Matt Kempkers, defending champion and Olympic rep Sara Winther and Keith Inglis from Taupo round out the top five but have their work cut out to catch Andrew tomorrow. In the masters Kris Decke stamped his authority on the fleet, with 3 wins from the 3 races. Clean starts and good old fashioned boat speed kept him at the front of the fleet, although Andrew Dellabarca from Muratai and Stuart Fanshawe from Thames both had very consistent days with top places in all three races. Andrew lies second with overnight leader Kent Copplestone now 3rd. In the Radial Masters Scott Leith stamped his authority on the fleet with a second and two firsts to lead overall from Edmund Tam, who pulled off a win in the first race to go with a second and fifth. Others to have a good day were Mike Keeton who achieved two thirds and Pete Thomas a 3rd and 4th. The 4.7s again had close racing among their small fleet with Bryn Bennett from Worser Bay enjoying a great day with 4 wins to lead from club mate Cain Anderson with Scott Inglis from Taupo in 3rd. Tomorrows forecast is again for light to moderate winds. All divisions look like being down to the last race to decide the final results. With two races scheduled for all fleets tomorrow we hope for a repeat of today’s excellent sailing conditions. Day two of the Laser Nationals got underway where day 1 left off; 180 degree wind shifts, zero to 25 knots every half hour and tricky tidal flows generally providing a nightmare for both the race committee and the sailors. It was a long day on the water with the day was dominated by extremely unsettled conditions. There was unseasonal snow on the nearby ranges and very cold squally showers from the SW, with the NE sea breeze sometimes attempting an appearance between squalls. Later in the afternoon the wind settled in the SW with a solid but cold 20 knots gusting up to 30 knots at times providing new challenges after the torture of the earlier 180 shifts and calm patches. With the testing conditions consistency was the name of the game and several of the favourites suffered from one or more hiccups during the day. Many will be looking forward to a discard coming into play after tomorrow’s races. 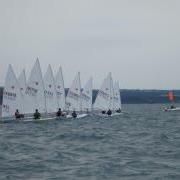 In the Laser Open division Andy Maloney and Sam Meech continued to fight it out at the front of the fleet and are only really separated by Sam getting becalmed in the wrong place at the wrong time in the first race of the day leading to a 10th place. Thomas Saunders continues to be the most consistent of the chasing pack, followed by Blair McLay and Dutch visitor Nicholas Heiner, who will be closer to the leaders when he can discard an OCS from yesterdays first race. In the Radial fleet Rachel Basevi leads after a consistent day. She is followed by a closely packed group including Andrew McKenzie, who would have led but for a DNF in race 3, Susannah Pyatt who found the afternoon’s strong winds a challenge, Keith Inglis who also suffered from and OCS in race 1 and a consistent Cullen LeRoy. Favourite and defending champion Sara Winther had a tough day with and OCS in race 1 and a 19th in the flukey race 2 before recovering for a 1st and 5th in the last 2 races. Matt Kempkers also stood out and but for an OCS in race 2 would have been in the leading bunch. In the Masters consistency was again the key. Kent Copplestone leads the Standard fleet, 1 point clear of defending champion Andrew Dellabarca with first time Masters competitor but former Laser champion Kris Decke tied on points with Rob Woodward 5 points back. In the Masters Radial an OCS to defending champion and 3 times World masters champion Scott Leith has left Hamish Atkinson from Christchurch leading overall from Kevin Jenkins of Onerahi. Proving that age is no barrier Great Grand Master Bob Blakey showed up many 20 or more years his junior finishing the day in 3rd overall. In the 4.7s Scott Inglis from Taupo leads a close fought contest from Worser Bay sailors Cain Anderson and Bryn Bennett. With light winds forecast for tomorrow continuing challenging conditions are likely to mean consistency is again the key, with 3 or 4 races scheduled for all fleets to catch up on races lost on the first day. It was a frustrating day for all at the first day of the Laser National Championships at Napier Sailing Club. The fleet of over 100 was on the water for the scheduled 1pm start but the wind spent the whole afternoon boxing the compass and constantly varying from nothing to 20+knots so only one race was completed for the Laser Open division with none of the other divisions managing to complete a race. In the only race completed favourites Sam Meech and Andy Maloney dominated the Open Standard Laser fleet, finishing first and second in a race that became a reaching contest part way through as the wind repeatedly shifted. Both come to the championships having had strong seasons on the international circuit. Others to have solid races included rising stars Thomas Saunders and Michael Cate, who will be looking to challenge the favourites for the balance of the regatta. In the Radial fleet everyone is out to topple current National champion and NZ Olympic rep Sara Winther, who is back for another Olympic campaign. Others expected to feature in the women’s fleet include Susannah Pyatt , who was part of the match racing crew at the London Olympics, and Rachel Basevi who has been close to the pace for the last couple of seasons. In the Youth Radial we expect a close contest with the favourites including Andrew McKenzie, last years winner. In the Masters two of our current trio of World Masters champions are in the Radial fleet, Scott Leith and Mike Keeton, with Mark Orams missing while he recovers from injury. In the Standard Masters Andrew Dellabarca is back to defend his title with a strong fleet of challengers looking to deliver a close contest. A small fleet of 4.7’s has entered but with 3 of the fleet looking to represent NZ at this years World Championships we expect a hard fought regatta. With the loss of races today an extra race for all divisions is now schedule for tomorrow and with fresh SW conditions forecast we hope to have a more productive day for all fleets.